Coming as it was two days after the drawn final, Moycarkey-Borris and Durlas Óg delivered another memorable final of the Centenary Co-Op sponsored Premier 12 end game in the Ragg on Monday week last, with the Moycarkey outfit edging it after a stirring second half display. Turning a half time deficit into a winning position, the influence of Darren Flood and Max Hackett in particular laid the foundation of victory for the red and gold. Flood led by example and was excellent throughout and was the main difference between the sides in the opening quarter, though Kieran Costello at centre back for Durlas Óg was giving him a run for his money on that front as he mopped up ball after ball. Still Moycarkey led three points to nil after six minutes, with all scores from the hurl of the free flowing Flood. But Durlas Óg settled and showing good composure started to get moving up front and strung some nice moves together. Eoin Purcell opened his side’s account latching onto a long free by keeper Dara Stakelum. James Armstrong then set up Joe Dwan who saw his goal bound shot excellently stopped and deflected over the bar by Kyle Shelly in the ‘Borris goal. After all Moycarkey’s earlier endeavour, parity was restored when the industrious Purcell added his second in the twelfth minute. With nothing between the sides now the game flowed end to end. However, Durlas Óg took a crucial gain in the latter minutes of the half when Jack Lanigan pushed his side in front with a free which was quickly followed with another, this time a super point by Cian Stakelum from a placed ball in the middle of the field. Advantage Durlas Óg at the break 0-5 to 0-3. Two minutes into the second half Flood was fouled bearing down on the Durlas Óg goal. Dusting himself down he pointed the resulting free to leave one between them. Hackett had now burst into life and was causing damage out in the middle. He levelled affairs on seven minutes as both sides raised the tempo considerably. Next Cian Stakelum went on a charge in off the right and as he neared the goal opted to kick with the boot only to see his effort go wide of the left hand post. Lanigan had the Thurles lads back in front minutes later from a free after Joe Dwan had been fouled. But the lead didn’t last for long as the game turned in the next move. From the puck out from Shelly the ball broke to Flood who took flight down the left flank and having lost his marker hit a super strike to the net giving the keeper no chance. Still though Durlas Óg came back at them and had a chance to put the minimum between the sides but saw a free from Lanigan go narrowly wide. Both sides were trying hard now to push on but the backs were tightening up, with Peter Melbourne to the fore for Moycarkey and Seán Collins and Conor Stapleton showing flashes of their talent at the opposite end. It was in the middle of the park though where Moycarkey now held the edge, Hackett was immense and together with Flood they tormented the Durlas Óg backs. Into the last quarter a point apiece from this pair pushed Moycarkey’s lead out to four. As Durlas Óg surged forward once again, tapping into the well of promise once more, they couldn’t find the key to unlock the Moycarkey defence. Lanigan was unfortunate when his twenty metre free for goal came back off the post and was cleared. In the dying minutes intense pressure from Durlas Óg was met with resolute resistance as Melbourne and his backs snuffed out attack after attack. A combination of sixty five’s were dropped in by Stakelum with the intent of opening up goal chances, but in a crowded goalmouth those chances were practically non-existent. It was Moycarkey-Borris then who prevailed after a torrid closing to capture the crown, going one better than last year. 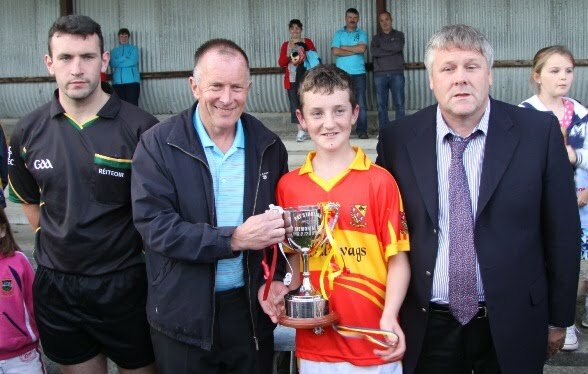 As was the case in the previous Saturday’s finals, referee Eddie Costello presented the medals to both sets of players before Mid Bórd na nÓg chairman, Joe O’Sullivan together with Denis Kennedy, representing Centenary Co-Op sponsor, presented the cup to winning captain Darren Flood. 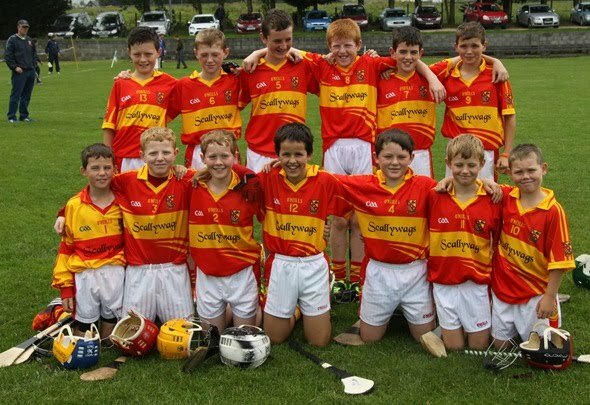 Moycarkey-Borris; Kyle Shelly, Brian O’Callaghan, John Coffey, Peter Melbourne, Darren Flood (Capt) 1-5 (0-1f), Kevin Hayes, Michael O’Donnell, Lewis Kearney, Max Hackett 0-2, Andrew Alexander, Owen Sheridan, Kyle Ryan, Liam McDonagh. Durlas Óg; Dara Stakelum, Paddy Creedon, Conor Stapleton, Sean Collins, Paddy Stakelum, Kieran Costello, Joe Dwan (Capt) 0-1, Cian Stakelum 0-1f, Eoin Purcell 0-2, Jack Lanigan 0-2f, Jordan Fahey, James Armstrong, Jack O’Dwyer.